1. Buddhism classifies all material and spiritual matters and knowledge in the universe into five aspects. Complete mastery of these five aspects is called having realized the Five Vidyas (vidya is a Sanskrit word meaning brightness). Buddhas and Bodhisattvas must possess the Five Vidyas. The Five Vidyas include: the Vidya of Causality, the Vidya of Healing, the Vidya of Sound, the Vidya of Craftsmanship, and the Vidya of Inner Realization. Looking through the entire history of Buddhism, His Holiness Dorje Chang Buddha III is the first holy one to perfectly manifest real accomplishments in the Five Vidyas, meeting the highest standard of Buddhism. 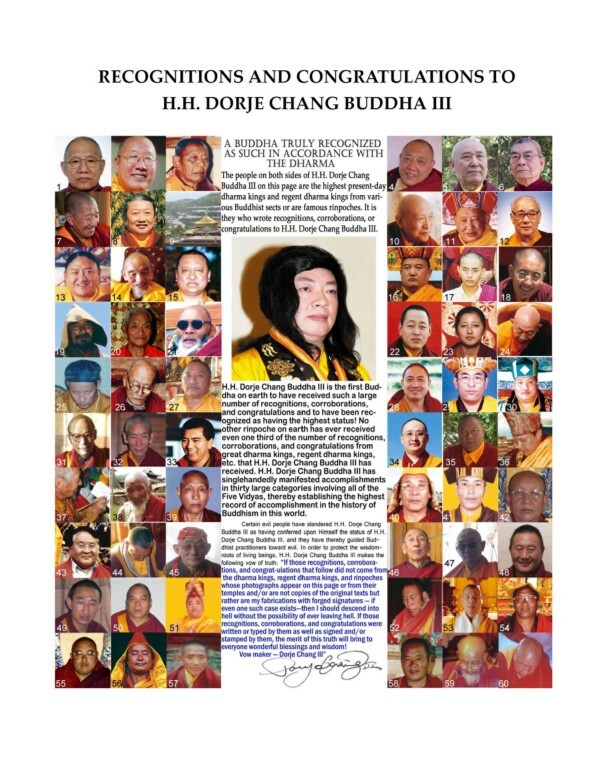 For this reason and more, His Holiness Dorje Chang Buddha III is the one and only individual in history to receive recognitions and corroborating recognitions from over 60 of the highest present-day dharma kings and regent dharma kings from various Buddhist sects. 2. 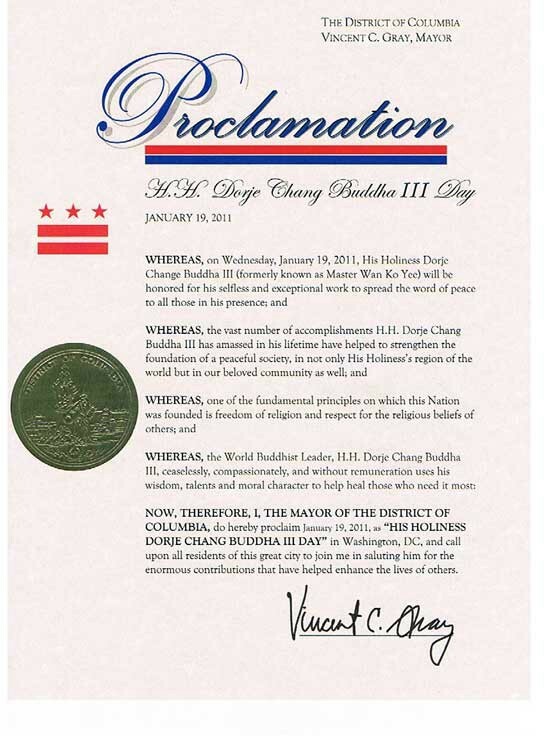 His Holiness Dorje Chang Buddha III was awarded the Top Honor Prize during the World Peace Prize Ceremony at the U.S. Capitol on June 14, 2011. The World Peace Prize is an initiative to promote world peace and understanding between different nations, ethnicities, cultures and religions.His Holiness Dorje Chang Buddha III was recognized for receiving this Top Honor Prize by the 112th Congress in U.S. Senate Res. 614, commending His Holiness the Buddha for his role in advancing peace, justice and inter-religious collaboration.